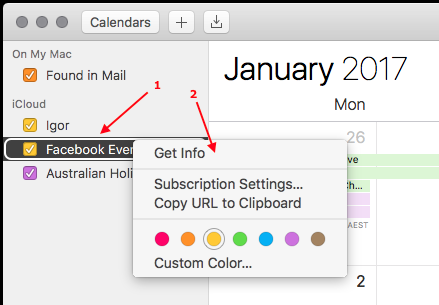 I've noticed that in my Calendar app on macOS I had a 'Facebook Events' calendar stored in iCloud. Initial attempts to remove it didn't work. The Edit menu Delete option was greyed out and pressing Delete on the keyboard after selecting that calendar also didn't work. After a bit of messing around I did find a way to delete it. 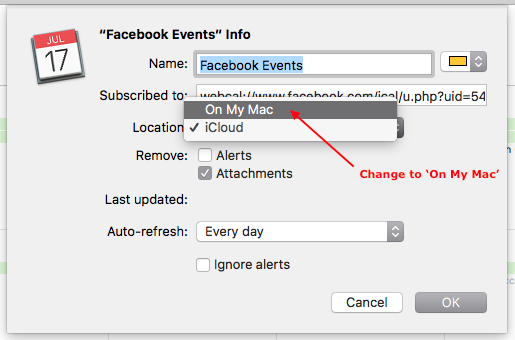 If you have a calendar in iCloud that just won't go away, follow these steps to remove it. Right-click the calendar in the Calendar app and click 'Get Info'. Change the Location to 'On My Mac'. The calendar will now appear under 'Other' instead of 'iCloud'. 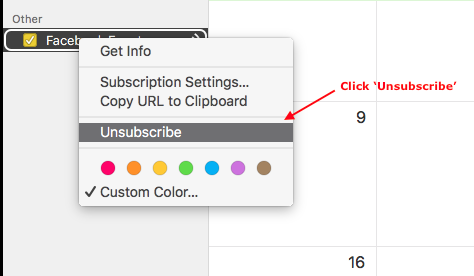 You can now right-click the calendar and click 'Unsubscribe' to remove it permanently.